Since the Tramex Moisture Encounter uses low-frequency signals sent through conductive pads, instead of metal probes or pins, there is no damage to the surface of the material being tested for moisture. Moisture problem areas can be immediately found, without any scratching or drilling of the surface. 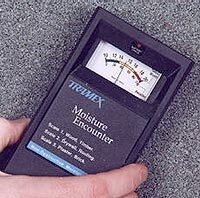 Simply turn the Moisture Encounter on, select the appropriate scale, place it on the material surface and you can immediately read the amount of moisture off the meter. By moving the meter around the area you can find the specific area where the greatest moisture occurs. Non-destructive moisture meters can be used for building inspection, roofing installation, flooring, drywall taping and painting, along with flood restoration. Tramex has been building moisture meters since 1980.